Over the past decade, zebrafish has built up the reputation of being a valuable vertebrate model to study relevant aspects of cancer biology, including angiogenesis and metastasis. In recent years, zebrafish has also grown as a model for oncoimmunology, providing important insights into the role of immunity and inflammation in cancer initiation and progression. 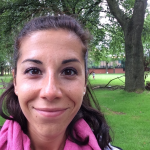 Elegant work from the Martin lab in Bristol showed how at the early stages of cancer onset, transformed cells initiate the recruitment of macrophages to support their own proliferation. The immune cells indeed locally produce and secrete the trophic signal Prostaglandin-E2 (PG-E2), helping tumour cell proliferation (Feng Y. et al., 2010; Feng Y. et al., 2012). Less clear is how inflammation contributes to later stages of cancer development and particularly to the onset of metastatic lesions. This aspect is quite challenging to study at a single-cell level due to the lack of a suitable in vivo model system. Indeed, despite still being the most widely used model for oncoimmunology, mice present a number of limitations: metastatic lesions develop over a long period of time and live imaging in deep tissues is very challenging. Moreover, this type of study would require the use of many mice to be statistically significant, which is ethically questionable as well as expensive. Zebrafish overcomes these disadvantages. Fish develop rapidly and the larvae have a transparent body. Therefore, metastasis can be easily observed and its 3D architecture studied. In addition to these points, the innate immune system shares high degree of homology to their human counterpart. Therefore, the model offers the possibility to delineate in vivo the role of human immunity and inflammation during cancer progression and the onset of metastasis. To achieve this ambitious goal, a first step is to demonstrate that components of the human immune system introduced in zebrafish can survive and show normal cellular behaviour. In this work, Paul et al. introduce cells of the human immune system into the zebrafish and characterise their survival rate as well as cellular behaviour. 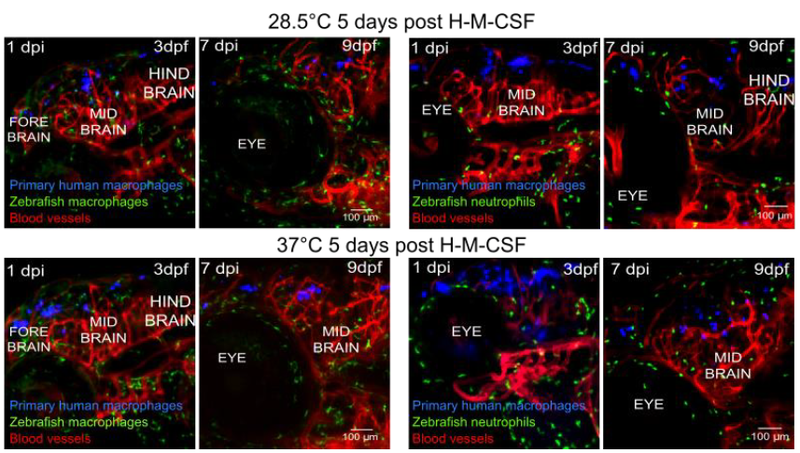 They find that human monocytes not only retain the ability to differentiate into functional macrophages at the zebrafish physiological temperature of 28.5°C but they also survive over a period of two weeks once injected into the hindbrain of immuno-competent animals. Furthermore, human cells migrate through tissues, as expected for cells with immune surveillance function (Figure 1). Another interesting observation from this work is that human monocytes cultured at 28.5°C mature into CD14+-macrophages and they show a gene expression profile typical of activated cells, both in vitro and in vivo. However, monocytes differentiated at 28.5°C are less plastic than those cultured at 37°C. In other words, these cells are less susceptible to changes in phenotype(s) and function(s) in response to local variations of the environment. Figure1: Human macrophages (in blue) differentiated in vitro at either 28.5°C or 37°C uniformly disperse in the brain of injected animals and show high level of survival rate over time. The injection of human cells does not elicit an immune response as observed by looking at the distribution of zebrafish neutrophil (in green). Figure is adapted from Figure 6 of the preprint. For decades, there has been a great interest in understanding key aspects of immunity and in modelling how the immune response is orchestrated. In recent years, zebrafish has emerged as a powerful model system that will greatly benefit immunology research. Indeed, the zebrafish immune system shares high homology with its mammalian counterpart and this makes the fish an appealing alternative to the mouse model to characterise the role of immunity and inflammation in promoting the onset of physio-pathological conditions, including cancer. The novelty of the work discussed in this preprint is that for the first time elements of the human immune system have been successfully introduced in zebrafish. Therefore, the Tanner lab has set up for the first time a model that has the potential to clarify how human immune cells actively contribute to cancer progression and metastasis in vivo. Little space in the discussion is given to alternative applications of the model. I think that the Tanner lab actually set up a system that will greatly benefit areas of clinical research others than onco-immunology. For instance, by introducing human macrophages into zebrafish, researchers could try to better delineate the role of the human inflammatory response in axon degeneration during the onset of multiple sclerosis. Also, given the feasibility of large-scale chemical screens in zebrafish, the system could be easily used for the screening and identification of compounds more effective in modulating human immunity and therefore in the design of anti-tumoral and axon-protective therapy, respectively. Feng Y., Santoriello C., Mione M., Hurlstone A., Martin P. – Live imaging of innate immune cell sensing of transformed cells in zebrafish larvae: parallels between tumor initiation and wound inflammation- Plos Biol. 2010 Dec 14; 8(12) 1000562. doi:10.1371/journal.pbio.1000562. These preliminary data suggest that zebrafish is an excellent model to delineate the heterotypic interactions between a human cell of interest and an immune cell in vivo. One such example of interest to the lab is the ability to study patient derived -tumor cells with matching patient-immune cells while maintaining single cell resolution. We are excited about the initial findings and will continue to build on this result.